It’s a crisp, sunny fall day. You want a warm, healthy meal in a sunny atmosphere, and you feel bright-eyed, bushy-tailed and ready to take on the day. Get pumped because we’re having breakfast at Sadie’s Diner! 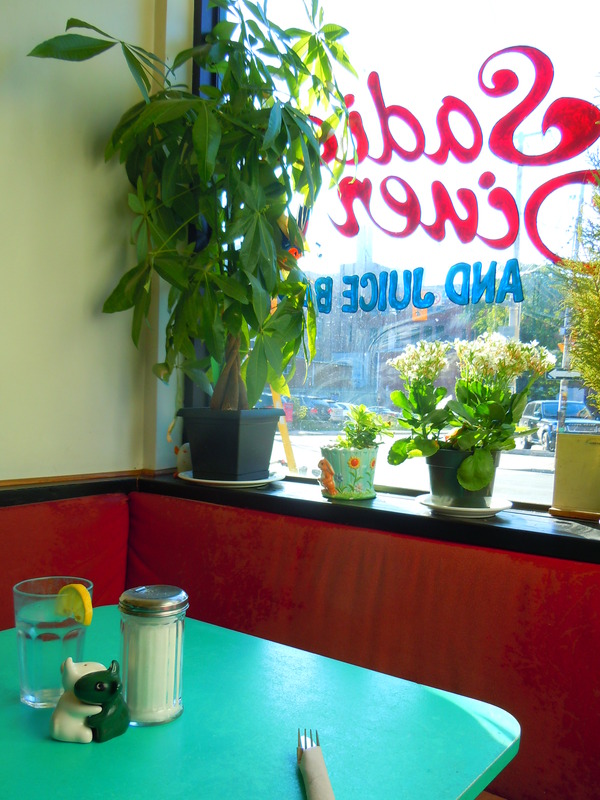 As one of Toronto’s most beloved vegetarian and vegan all-day breakfast diners, Sadie’s serves up vegan French toast, breakfast burritos, omelettes, huevos rancheros (egg and tofu varieties! ), pancakes, smoothies, fresh fruit juice, and plenty of lunch and dinner options for later on in the day. It’s been months since I’ve been back; my first visit was during this past April’s Veggielicious and I was so happy and excited to finally come back for seconds! Choosing my next meal here was no easy feat. Sadie’s serves up different veggie omelettes all throughout the week (they tweet their specials on Twitter! ), the breakfast burrito on the menu was whistling at me, and part of me just wanted to go to town with the vegan huevos rancheros dish I had for Veggielicious. That, and the tofu scramble. When I skimmed the menu online though, I knew exactly what I wanted and knew how perfectly it would fit into the Fall Harvest series: apple cinnamon buckwheat pancakes! When I came up with the idea to have a Fall Harvest series for the blog, I wanted to incorporate all the traditional fall foods that we know and love so much. 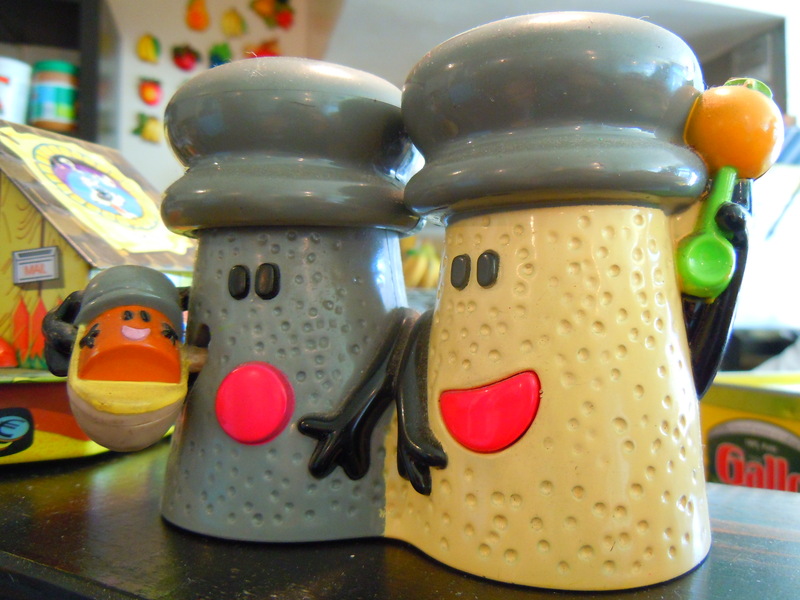 Things like apples, pumpkins, squash, maple, and comfort foods such as stews and chilis. I started brainstorming and I started researching. 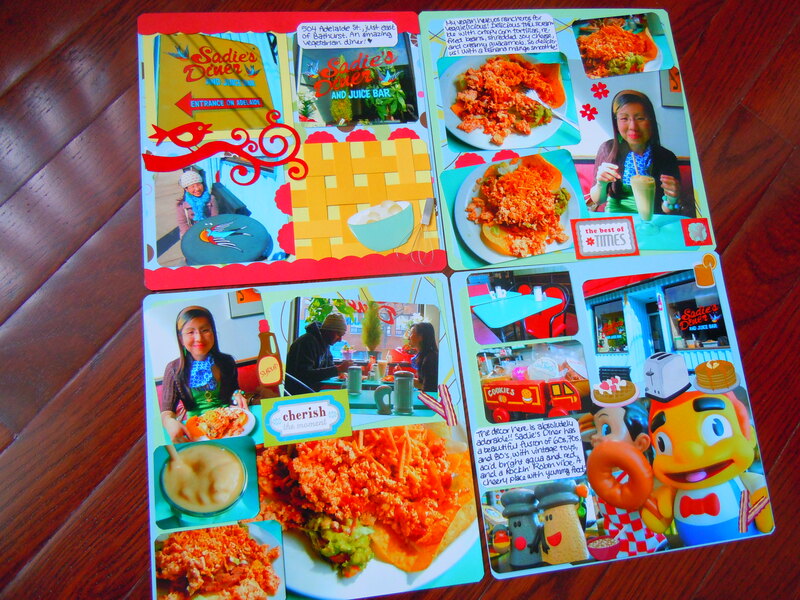 I wanted the series to be fun, and to include all different kinds of food and meals while at the same time keeping the posts creative in their content. 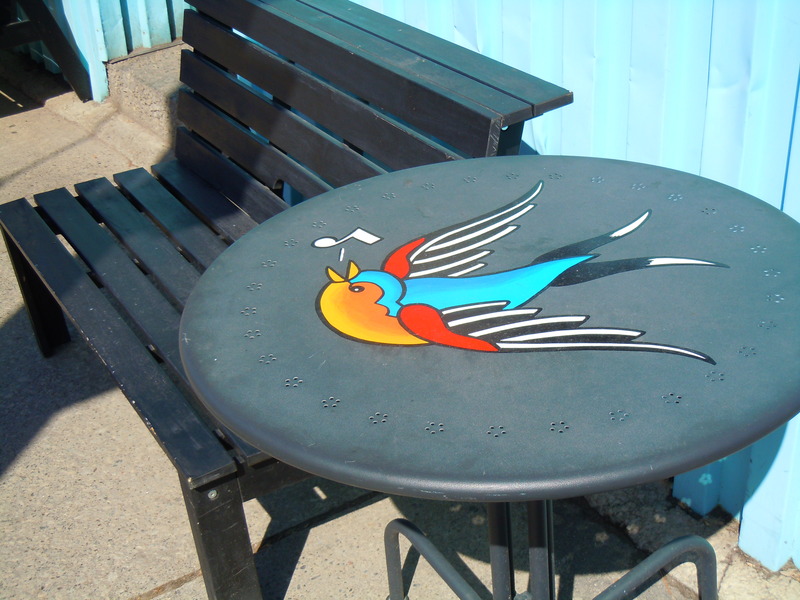 And talk about creative! I hit pay dirt when I found out Avocado Sushi had Japanese pumpkin on their menu (read: yesterday’s post) and that really inspired me to find different things around the city that utilized these tradtional fall favourites in interesting and delicious ways. 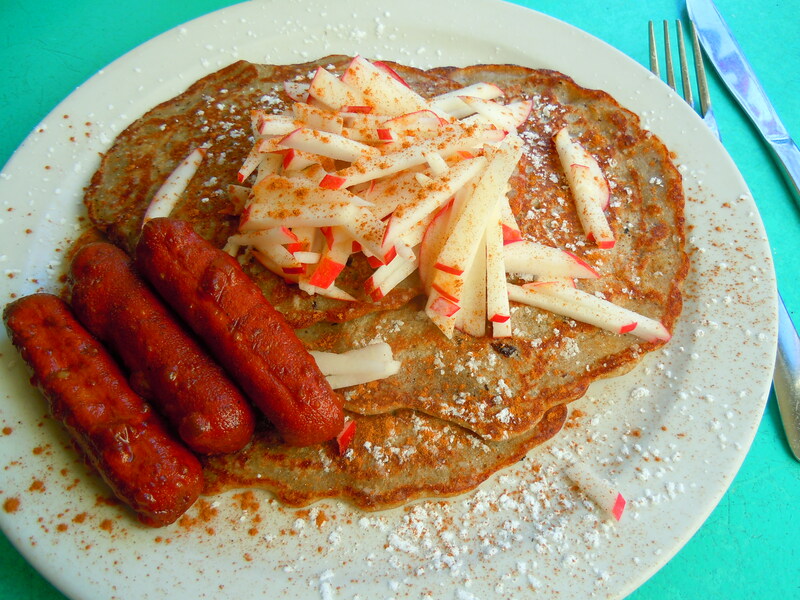 Enter Sadie’s Diner and their apple cinnamon buckwheat pancakes. This was the very first time I had buckwheat pancakes. Although I’ve had buckwheat (soba) noodles numerous times, I was completely in the dark about buckwheat pancakes until these babies showed up at my neon aqua table nice and piping hot. Contrary to its name, buckwheat actually does not have wheat in it; rather, it’s a fruit seed closely related to rhubarb, making it the perfect alternative to grains for those who have Celiac disease and gluten intolerance. In other words, THIS MEAL IS GLUTEN-FREE AND AWESOME! 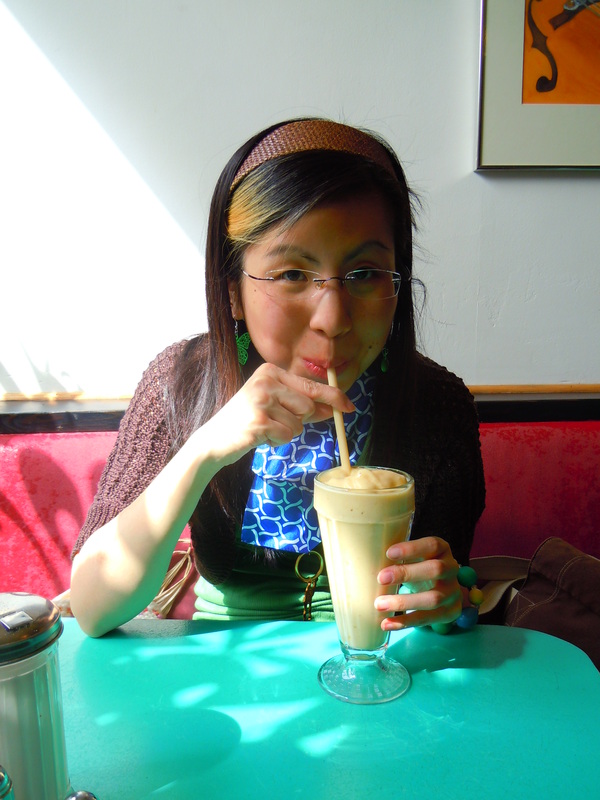 I know how difficult it can be for a lot of people to eat out and to find ways to make gluten-free meals for themselves at home without falling into a rut because I have friends who necessarily follow a gluten-free diet. I’m definitely going to try extra hard to add to this category of gluten-free options, so for the time being, keep a mental sticky note that Sadie’s has buckwheat pancakes with different flavours and fillings. This meal was so nice and warm and comforting. 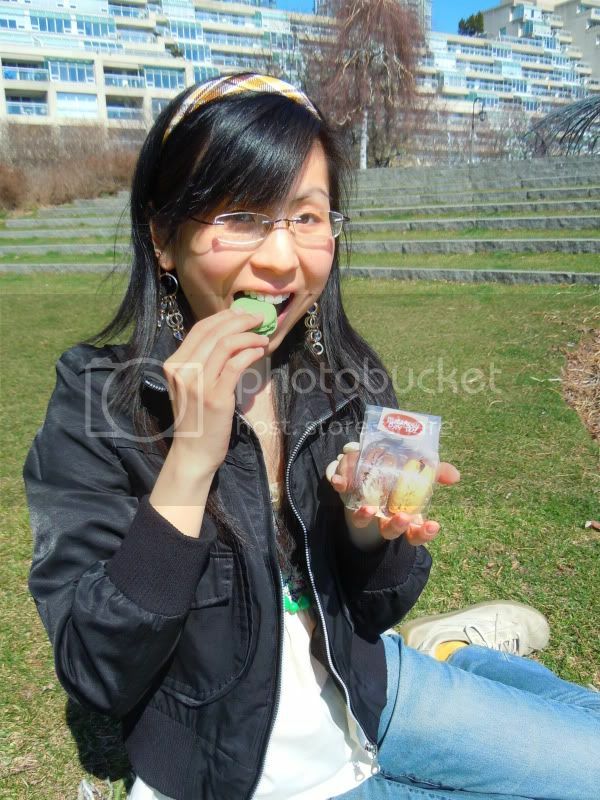 It was so perfect for a sunny fall morning and you could really taste the freshness, juiciness, and moistness in every bite. 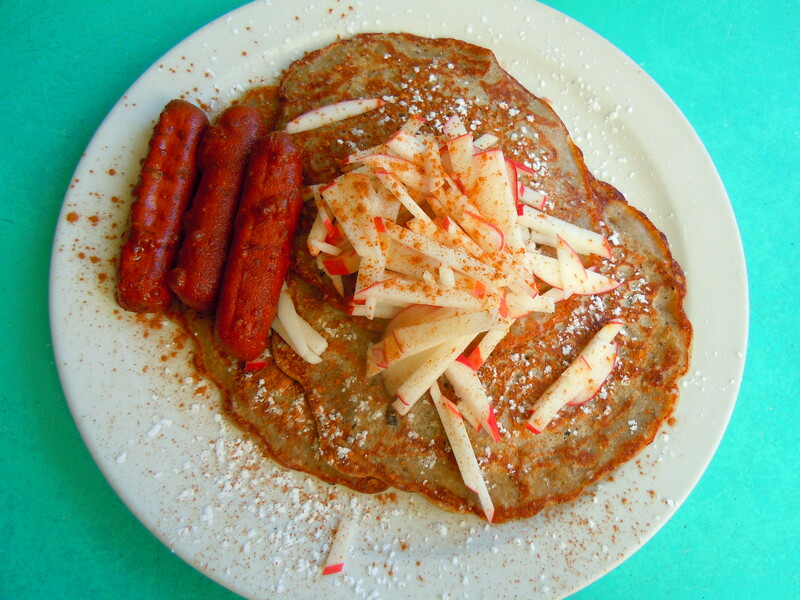 The apple cinnamon buckwheat pancakes comes with three large pancakes, thinly sliced apples, cinnamon, powdered sugar, and three veggie sausages. 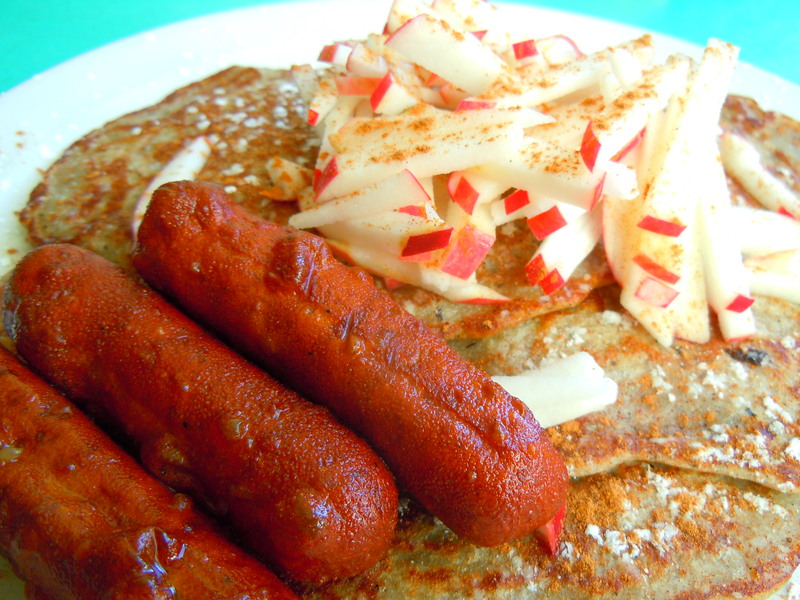 The buckwheat pancakes are SO different from your traditional “cake” pancakes. The flavour is much more savoury as opposed to sweet, with a slight tang and I know this might sound weird, but I actually really enjoyed these pancakes more as they got colder throughout the meal! Warmth is obviously a good (and necessary!) aspect in a meal like this, but I felt the flavour was even more enhanced after they had cooled down in combination with the cinnamon, powdered sugar, syrup, and apples. Now, if you’re accustomed to eating the “cake batter” type of pancake, it’s a flavour that might take some getting used to just because it’s not sweet. In my opinion though, it’s perfect for those who love the juxtaposition between sweet and savoury because the maple syrup, cinnamon, and powdered sugar totally kick the buckwheat pancakes in the pants and enhance the flavour SO much. You need to eat the pancakes with the apples and the sweet accents simaltaneously though if you want the best of all flavours. If you eat the pancakes all on their own, the savoury tang might be too overwhelming for those who aren’t accustomed to buckwheat. I have friends who aren’t into breakfast foods like waffles and pancakes because they’re just not into “sweet” breakfast food, but in this case, it’s the perfect balance, especially with the veggie sausage alongside it. The pancakes are moist and juicy and incredibly easy to eat; it’s a hearty meal that doesn’t make you feel like you’ve eaten a house! My absolute favourite part of the meal was the sliced apple. Oh my gosh, the apple truly takes this meal to the next level. It absolutely shines. The thinly sliced gala apples were so bright, clean, and fresh in its flavour and so full of sweet juiciness. 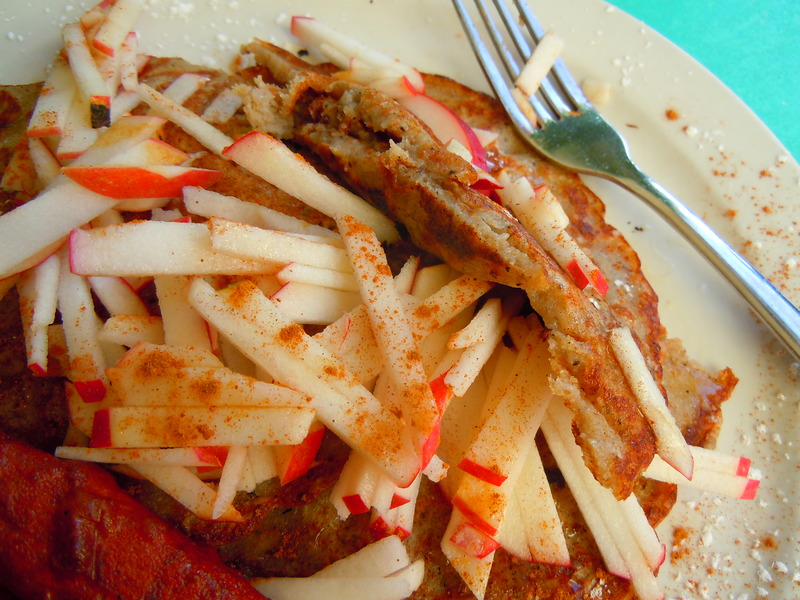 The apples were baked into the buckwheat pancakes and on top of the pancakes, making them perfect for me to eat! Hello, I’m allergic to the raw flesh of apples (among many other fruits) and need to have them baked and cooked in order for me to eat them and not swell up like a blowfish. 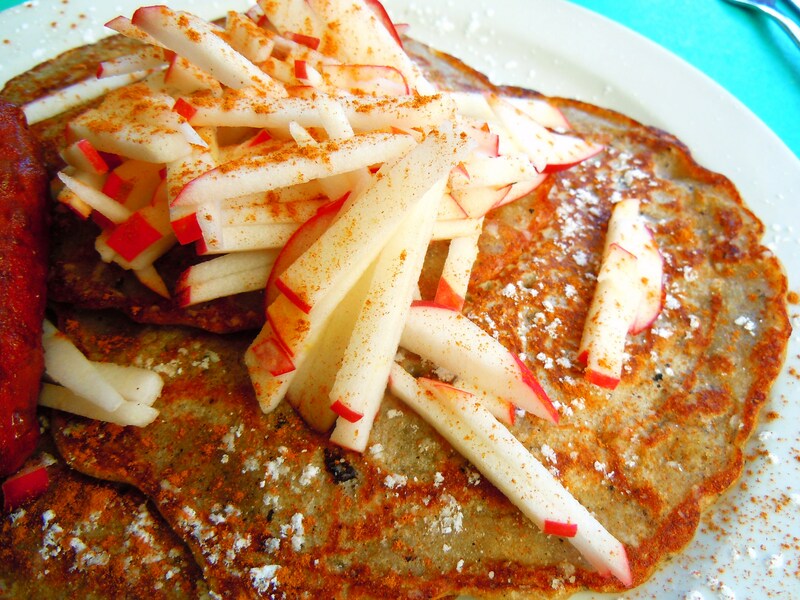 So hurray for baked juicy sliced apples on buckwheat pancakes! I loved the apple so much and it made my day knowing I could still taste the natural sweetness of it without having it sacrificed in cooking. When I was eating the apples with my pancakes, I felt like I had bitten into an apple orchard. This is the fall harvest, on a warm breakfast plate, at its finest. 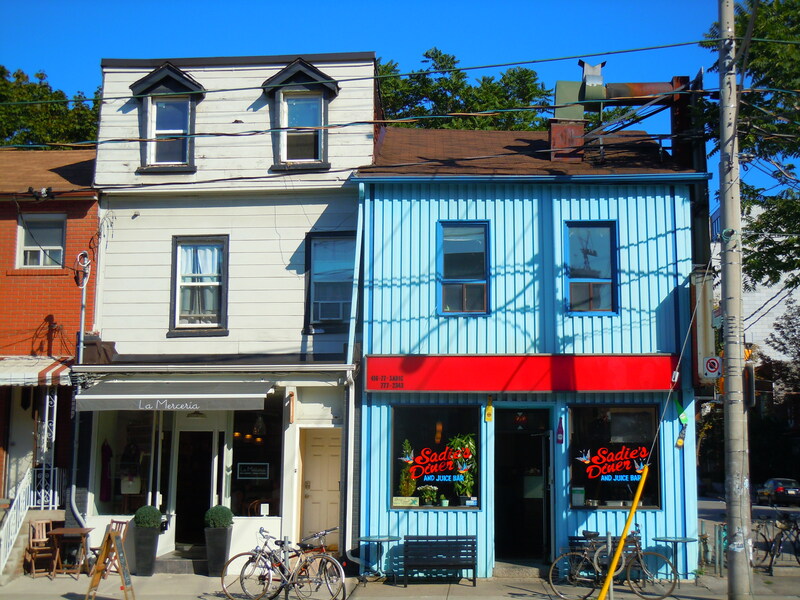 Sadie’s Diner is located at 504 Adelaide St. West and Portland Street, just east of Bathurst St. They are open for business at 7:30am from Monday-Friday, and at 9am on weekends. 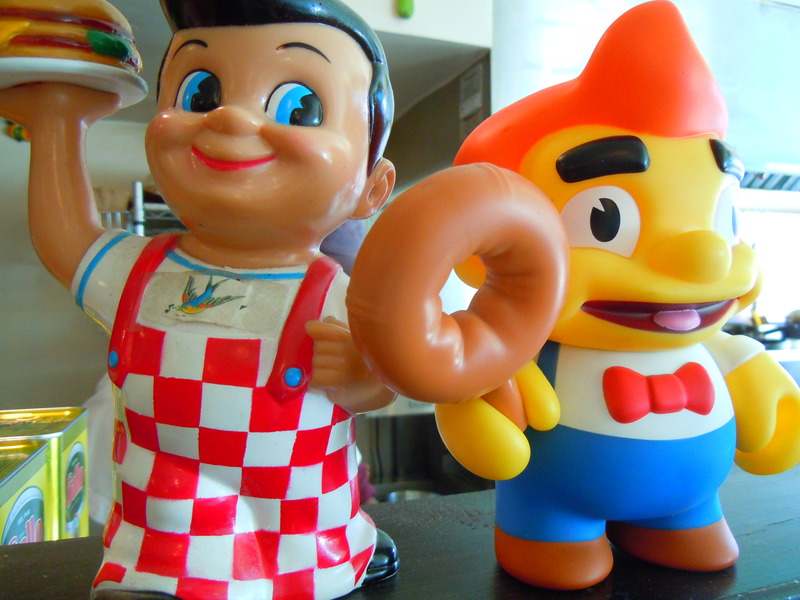 They are open until 10pm and they serve all-day breakfast along with lunch and dinner. 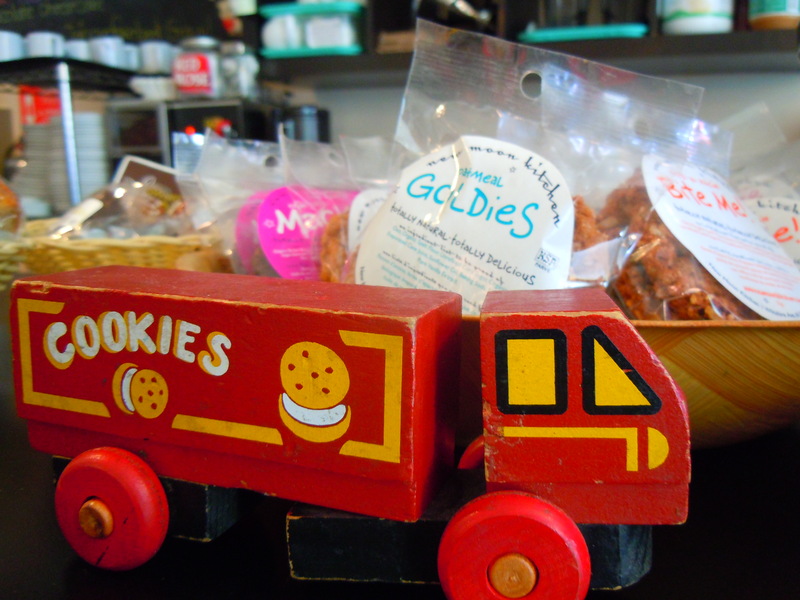 Sadie’s is vegetarian and vegan with a number of gluten-free options. It’s about time I posted these pictures up! 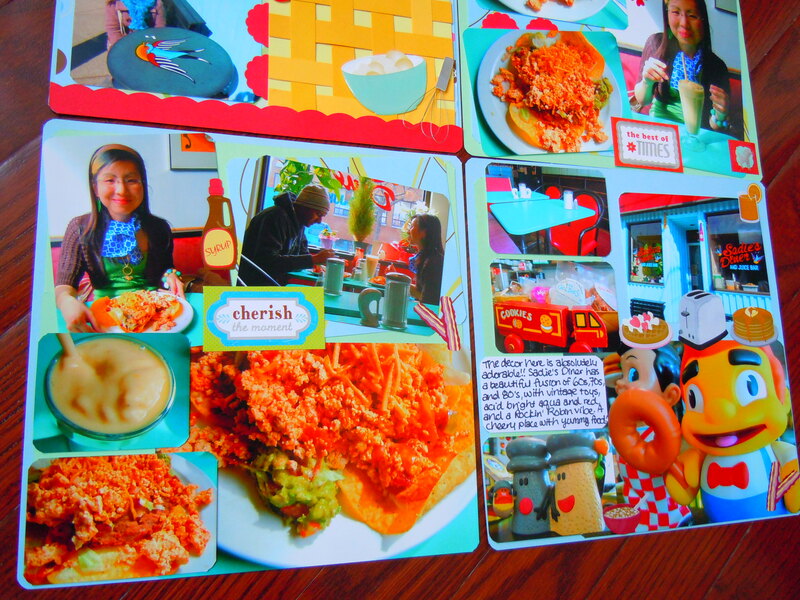 I actually went to Sadie’s Diner several days before Veggielicious wrapped up but I was too stubborn to blog about it until I developed some photos and made my scrapbook layout for it. I was so excited about the experience and the decor and the food that I was completely unwilling to go ahead without a layout. It’s here now though and I hope you all liked the pictures I posted yesterday as a teaser to today’s post! 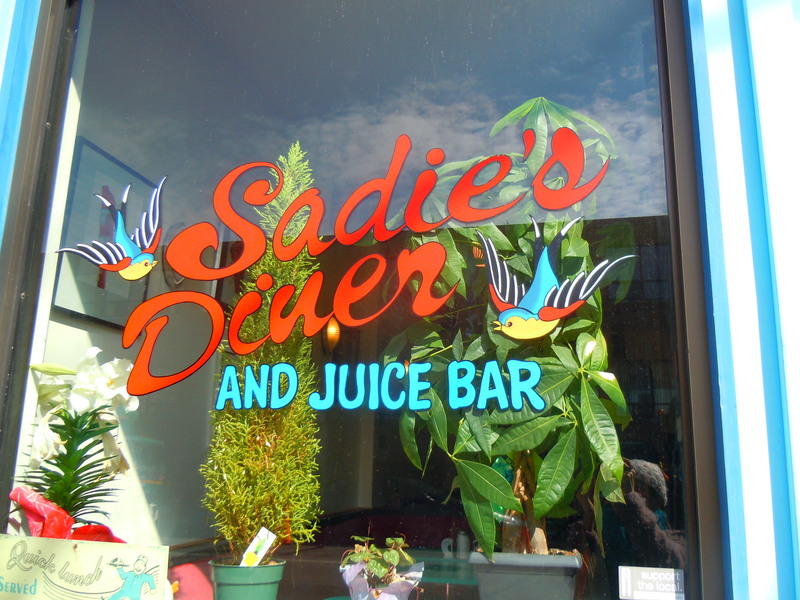 I’m so happy I found out about Sadie’s Diner through the Veggielicious event because it is yet another place that I envision myself coming back to over and over. 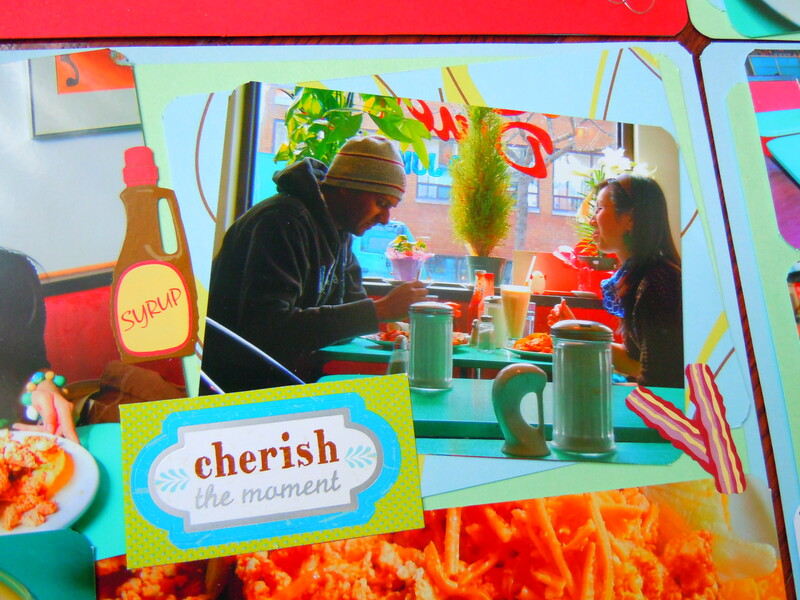 Not only is the decor indicative of and inspired by decades of vintage foodie memorabilia, but it’s a vegetarian breakfast diner with vegan huevos rancheros for crying out loud, c’mon! 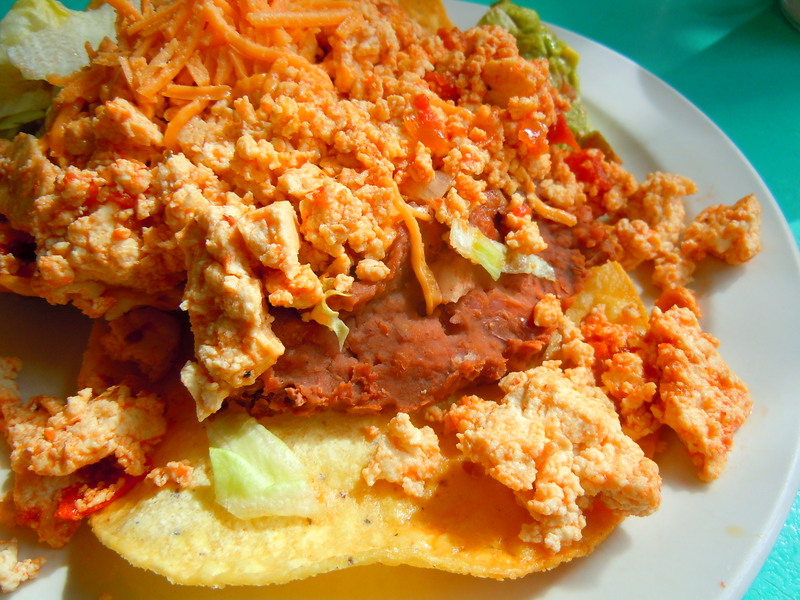 😀 Huevos rancherous is one of my favourite breakfast dishes (that I could eat any time of day, really) and I thought it was so cool that they offered a vegan version with tofu scramble instead of eggs. For whatever reason, I had a hankering for tofu scramble during the month of April and I was daydreaming about tofu scramble sandwiches all month long. So tofu huevos rancheros? Hell yes! 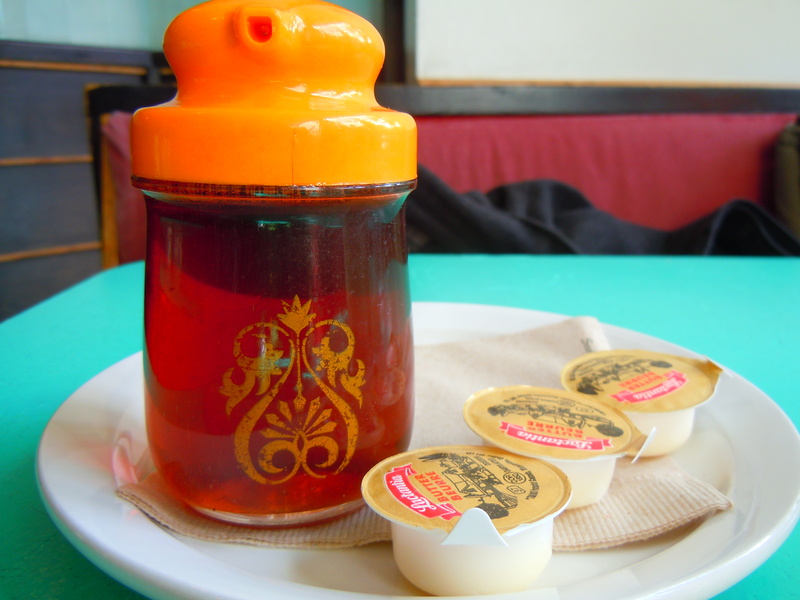 I do love eggs, but it’s all about having choices and making food accessible to everyone despite differences in diet and I’m so pleased that there is a great vegetarian breakfast diner like Sadie’s within the heart of downtown Toronto. 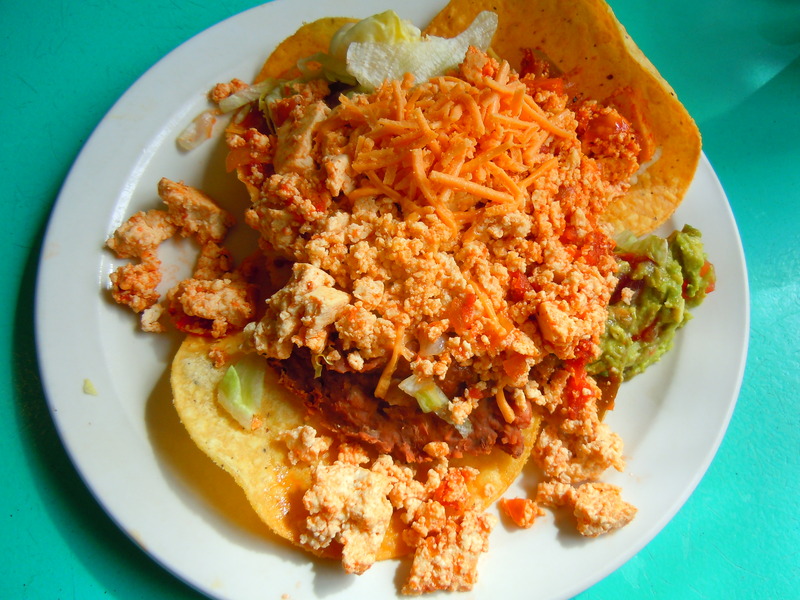 Traditionally, huevos rancheros is a Mexican breakfast dish comprised of fried eggs (think sunny side up), guacamole or sliced avocados, some form of tomato sauce and/or salsa (or pico de gallo), and refried beans, all served on top of soft or lightly fried corn tortillas. Sadie’s Diner offers the traditional version with eggs as well as a vegan version with tofu scramble replacing the egg portion of the dish. 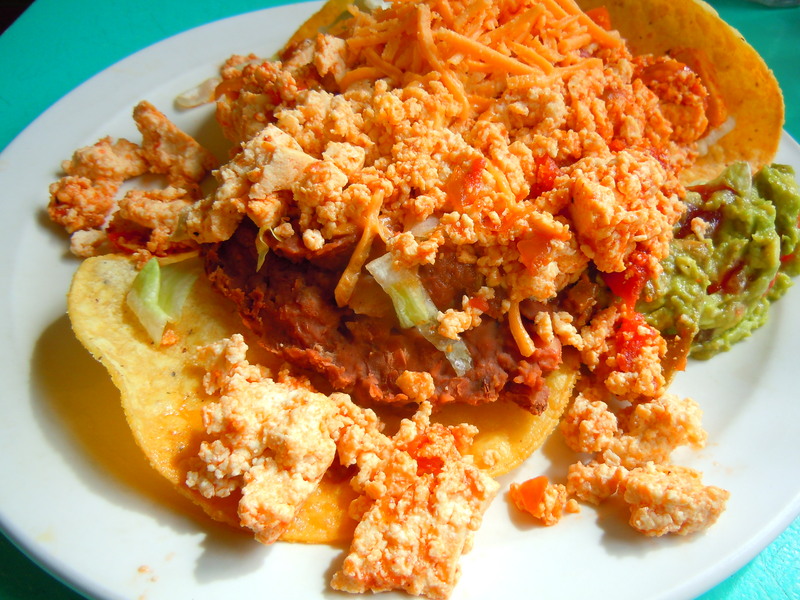 There are three large crunchy corn tortillas, a huge helping of tofu scramble with a bit of tomato flavour to it, refried beans, creamy guacamole and tomato salsa, and a delicious sprinkling of shredded soy cheese that just melts in with the warm tofu and it is just yum omg! The tofu is great because it’s firm and doesn’t fall apart, all the while absorbing the flavours from the rest of the plate. Each compenent was delicious and held its own. The guacamole was very creamy, the refried beans were incredibly smooth, and the shredded soy cheese was so delicious and quite honestly, I think this is what kicked the dish up another notch! Inevitably, parts of the corn tortillas didn’t stay as crispy during the duration of the meal simply because of the weight of everything that was on them, but as a whole the dish was delicious and I was full and so satisfied. It was forkful after forkful of great flavour and I’m glad that the tofu didn’t succumb to its bland reputation or end up tasting like someone dumped a whole salt shaker over it. I’ve eaten a lot of tofu in my lifetime and it’s the bland reputation that causes the overseasoning where people will literally drown it in soy sauce and it’s not necessary to go seasoning berserk on it like that. It absorbs flavour really easily so if it’s being served on its own, herbs and lighter sauces (like the full-bodied tomato flavour in this scramble) are good enough and if it’s served with other things, it’ll take on those flavours. And of course, grilling it makes it great too! 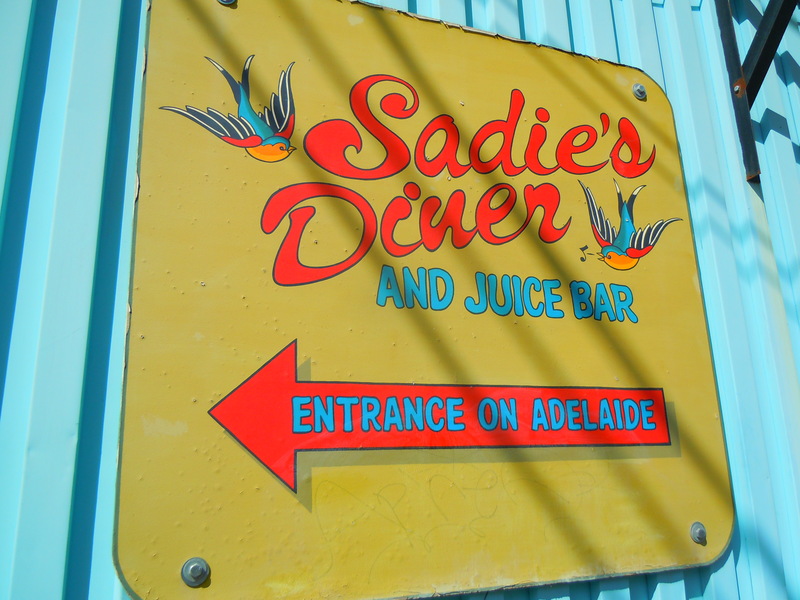 Sadie’s Diner is located at 504 Adelaide St. West, just east of Bathurst St. They are open for business at 7:30am from Monday-Friday, and at 9am on weekends. Oh, it gets cuter, better, and yummier from here on out! 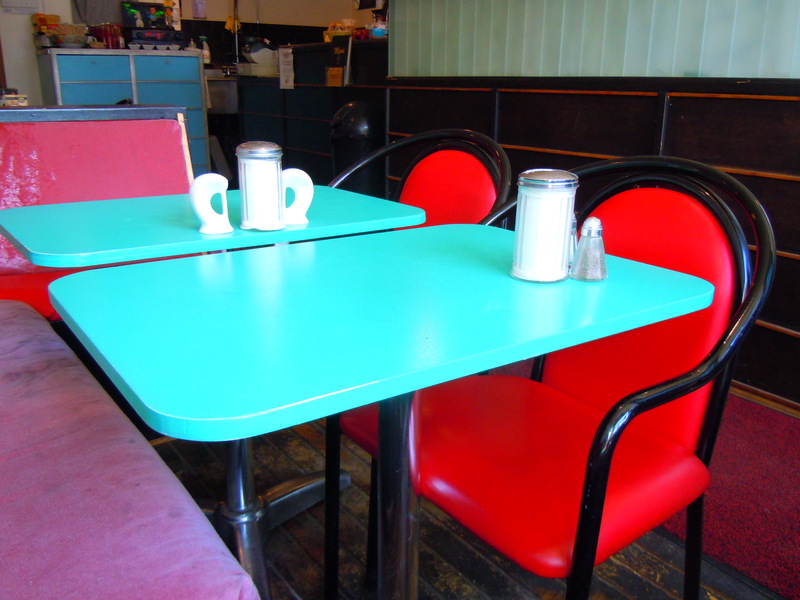 Imagine the 50s, 60s, 70s, and even a little bit of the 80s combined into one vintage, jiving, acid bright diner dishing up mouthwatering breakfast favourites vegetarian and vegan style with the ding of a bell. 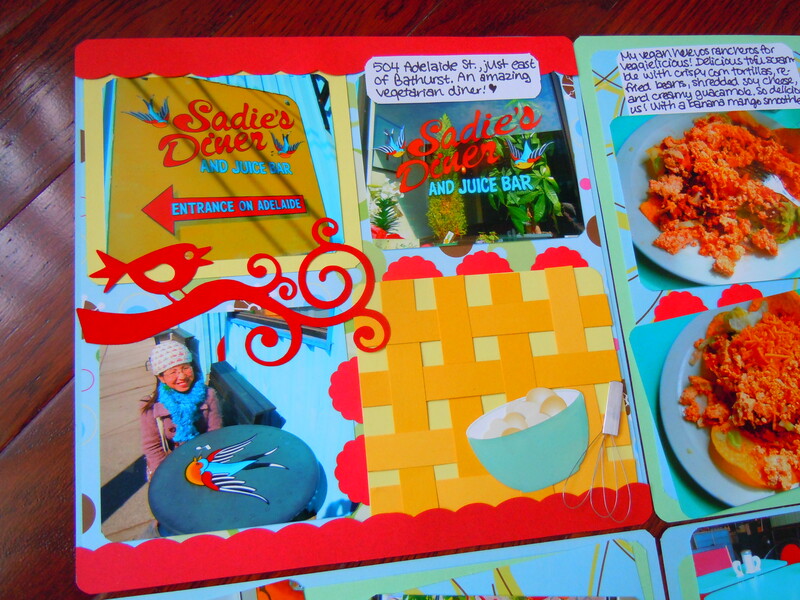 I am in conniptions over Sadie’s Diner and this is part 1 of my 2-part post. 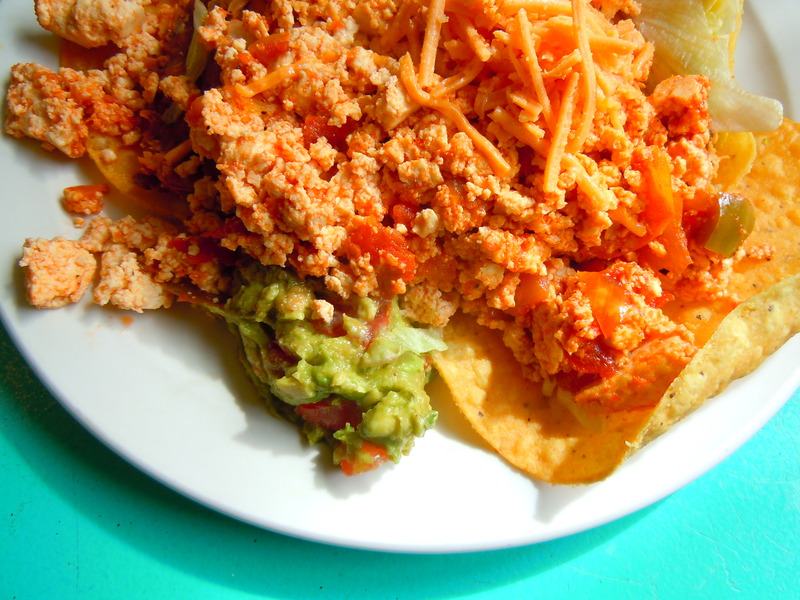 Prepare yourself for a rockin’ robin good time at this vegetarian breakfast diner and feast your eyes (and that growling tummy) on the vegan huevos rancheros. 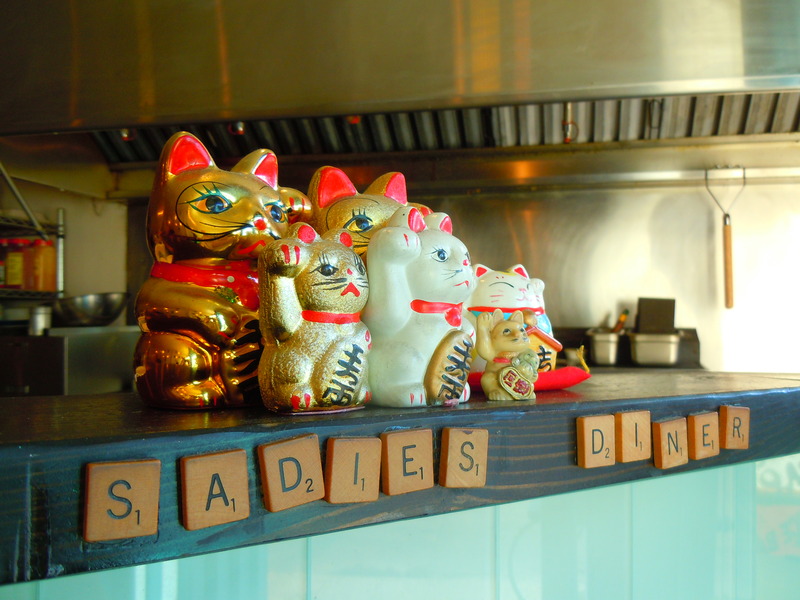 Because all the little foodies on Adelaide St. love to go to Sadie’s Diner and eat, eat, eat! 😉 Enjoy the pictures! 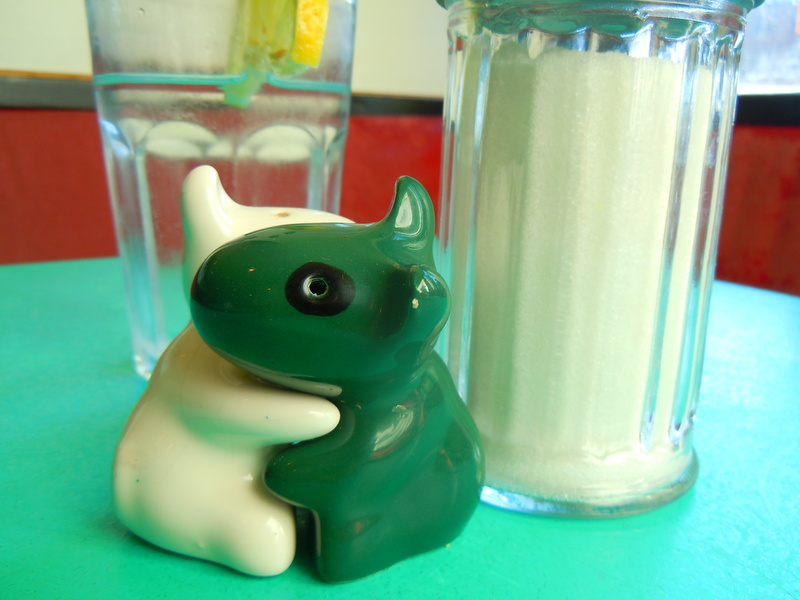 Sadie’s Diner is a vegetarian breakfast and lunch diner located at 504 Adelaide St. West, just east of Bathurst St.